Growing up, I was a card-carrying lover of large canines. My 100-pound Terrier mix was great to go running with — and according to my parents, “way more dog-like” than small dogs like Toy Poodles. But as I grew older, I realized that daily strolls and stressful vet visits with huskier hounds get somewhat exhausting. I also realized that streamlined, fuel-efficient cars weren’t necessarily optimized for, say, Great Danes. 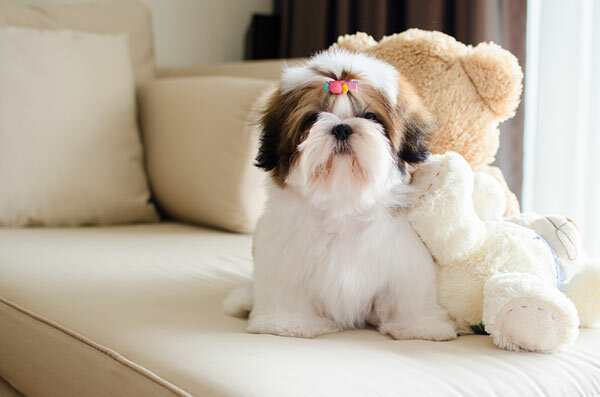 Cute Shih Tzu puppy. Photography by Shutterstock. 1. Little dogs are easier to lose — even in your own home. Small-breed dogs can be easy to misplace, even indoors. My first small-dog foster was a petite Pomeranian named Tabitha, who weighed all of 5 pounds. I quickly discovered that when it came to finding her in my modest condo, Tabitha was the canine equivalent of a lost sock in an 875-square-foot laundry basket. I eventually tied some cute jingle bells to her collar, which solved the problem. A friend suggested balloons instead, but I’m guessing those may have lifted Tabitha right off the floor. 2. Pint-sized pups can be persecuted by other pets or even become prey. My gentle Maltese mix was constantly roughed up by the family cat, who slightly outweighed him. This poor pooch would get stalked, smacked on the snout and slammed into bookshelves until we finally coaxed kitty up high, where she could have dominion. Some smaller dogs have naturally alpha personalities, but others can experience bullying by more overbearing pets. Comical? Maybe — but it’s no laughing matter if the aggressor starts viewing your vulnerable canine as lunch. Also remember: Petite pups sometimes become the target of dangerous predator/prey behavior at dog parks and are vulnerable to attacks from animals like hawks and coyotes. 3. Small dogs are susceptible to certain health hazards. 4. They’re often delusional about size. My spirited Shih Tzu mix Grant often tries to act much bigger than he really is. When we meet a German Shepherd Dog or Saint Bernard on the street, he’ll instantly try to jump up and “hug” the larger dog’s neck. Naturally, I prevent him — because while some pooches take this pesky behavior in stride, many perceive it as an immediate challenge. Since Grant appears bent on taking his life in his paws, my job is keeping him safe. 5. Tiny pups are subject to accidental injuries. It’s easy for tinier pups to get underfoot, even when you’re trying to be careful. So inadvertent kicking is always a concern — and literally, rolling over in your sleep could suffocate smaller dogs like Papillons or Chihuahuas. Remember, too, that some miniature breeds enjoy improving their vantage points by scrambling up high. If your canine leaps or accidentally falls from tall furniture, fractures could ensue. “It’s a recognized fact that certain small breeds like Italian Greyhounds have thinner, more fragile bones,” notes Anna Payton, executive director of the Naperville Area Humane Society. Dr. McIntyre also points out that the standard space between banister or railing spindles may be wide enough for smaller canines to squeeze through. Never let a diminutive dog out of your sight on a deck, loft, boat or balcony. These are high danger zones for small dogs as they can easily jump or fall off. Even if there is a protective barrier, it is more likely to protect humans than it will small dogs. 6. Small dogs are mobility challenged. Smaller dogs with sufficient determination can hurt themselves trying to get into cars or onto couches. Some will miss, bounce off, jump again and fall to the floor repeatedly — until you stop them, or they wind up at the emergency vet. A set of pet steps or a canine-friendly dog ramp can help eliminate this issue. 7. Little dogs tend to be treated like toys. I once walked in on a neighbor’s first-grader preparing to fling my frightened furkid off the edge of a dining room table. “I want to see if Rudy can fly,” she explained brightly as I protectively whisked him away, wondering where her parents were. It’s worth remembering that smaller dogs are sometimes treated like the stuffed animals they vaguely resemble. Sure, they’re small, cute and cuddly — but they’re also living, breathing creatures with measurable intelligence. That’s why canines value the mental stimulation that training games provide — and your guests will value their good behavior. Monitor your small dog around others, and take the time to teach basic commands. Educate yourself before making any breed a member of your family. Payton says she’s not aware of aggregated statistics specific to small dog surrenders at the shelter. Regardless, it’s always smart to conduct careful research before any adoption or purchase decision. “Educate yourself going in,” she recommends. “Understand the tendencies and potential challenges of any breed you’re planning to bring into your family.” That’s the best way to ensure your furry friend will always have a permanent place in your pack. The post 7 Things to Know About Having Small Dogs appeared first on Dogster.